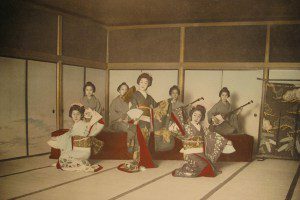 The photography of Ogawa Kazumasa in this article is based on images of Japanese ladies in the late nineteenth century and early twentieth century. In each image you will find nothing revolutionary nor will you find a “hidden mystery.” However, the simplicity of each image and the serene effect is most heartwarming. Indeed, if you venture into stunning gardens like Chinzan-so and you are lucky enough to see a female dressed in traditional Japanese clothes, then the “ghosts” of these images will instantly connect. It is this simplicity which appeals greatly because Ogawa Kazumasa isn’t showing an agenda or focused on highlighting perfection. 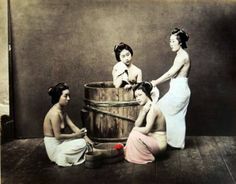 Instead, all these images are highlighting aspects of life in the distant past and from the purpose of female fashion, traditional Japanese clothes, the role of women in society, and other factors, then they do provide a glimpse. These photos also connect with the “mysterious world” of parts of Kyoto which are preserving tradition but from different standpoints. This applies to the serene looks of all the ladies in these photos and how life appears simple, refined, and at one with nature. Images of the world of geisha and traditional houses called okiya springs to mind when thinking about the old world of Kyoto. This applies to the elite of geisha and the high culture of karyukai (the flower and willow world). The photos by Ogawa Kazumasa are not based on this mysterious world but the simplicity and serenity of his images does conjure up a connection to “old Japan.” Of course, the reality may have been very different and this applies to all old photos which highlight aspects of past cultures in all societies. However, the dream world of “hidden mysteries” can be found in countless different cultures despite the real truth probably being very different. Yet without this “idealism,” “perfection,” and “simplicity,” the world would be more mundane and less appealing. Therefore, while Ogawa Kazumasa took normal photos it is often the “outsider” and “dreamer” who will take them to a different level. Despite this, the original meaning behind the images and the importance of these photos from a cultural point of view can’t be underestimated. 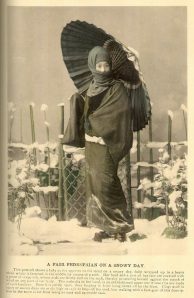 After all, they do provide a glimpse into the “old world” related to females in Japan irrespective if the area is narrow or not. The revolutionary period of the Meija era impacted greatly on Ogawa Kazumasa and the same applies to new technology which was opening up a new world. Also, his stay in Boston was most interesting because now he understood the reality of two major cultures. Therefore, he was a true innovator and his legacy is abundantly clear because he was a pioneer in photography and in photomechanical printing. 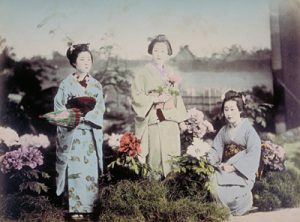 Ogawa Kazumasa opens up many aspects of the Meiji era and Taisho period through the photography he did. Also, he influenced many individuals during his lifetime and collectively a great deal of work was done which sheds light on both periods of Japanese history. Please note that Ogawa Kazumasa was born in Saitama prefecture which is near Tokyo but I have entered him under Tokyo because he was based in Tokyo. Also, Tokyo is where his career began in the field of photography, printing, and publishing. Some art and cultural articles by Modern Tokyo Times are republished in order to inform our international readership about the unique reality of Japan.